Can you believe this ad from Esquire magazine, from 1959? A little misogyny, perhaps? "men are better than women ! ﻿ Indoors women are useful -- even pleasant. On a mountain they are something of a drag. 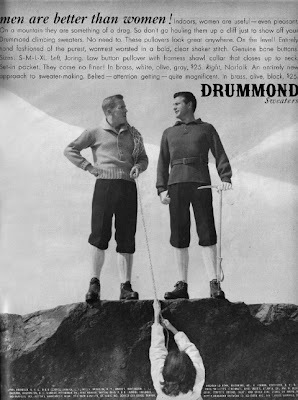 So don't go hauling them up a cliff just to show off your Drummond climbing sweaters. No need to. These pullovers look great anywhere. On the level ! Entirely hand fashioned of the purest, warmest worsted in a bold, clear shaker stitch. Genuine bone buttons. Sizes: S-M-L-XL. Left, Joring. Low button pullover with harness shawl collar that closes up to the neck. Set-in pocket. They come no finer ! In brass, white, olive, gray, $25. Right, Norfolk. An entirely new approach to sweater-making. Belted -- attention getting -- quite magnificent. In brass, olive, black, $25. DRUMMOND sweaters." I'm not sure from this picture, but the sweatres appear to be stocking stitch, not shaker stitch, by the way. oh dear! Some still think this way too!